The world of Exalted is a treacherous one, and the Threshold teems with danger. it springs from the alien might of spirits and the machinations of the Dragon-Blooded, from the raw power of the elementals and the ancient fury of the Lunzr Exalted. Whatever road they choose to walk, the obstacles the newly-reborn Solar Exalted must face are many. 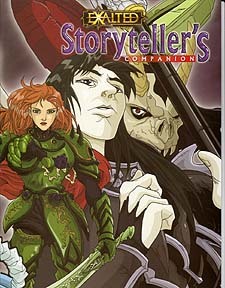 The Exalted Storyteller's Companion is a valuable resource for Exalted Storytellers, picking up where the rulebook;s Antagonists chapter leaves off. It includes expanded details of the spirit courts, exte3nded information on the other Celestial Exalted and a detailed look at the society and powers of the Dragon-Blooded. It also contains descriptions and statistics for a wide variety of magical devices and wondrous items.